The knife with many names, called Mocotaugan (moe-koh-tah-gan) by Algonquin speakers, Mokotagen by Potawatomi, Waagikoman and Waabikoman by the Ojibway, Dakota call it isáņ škópa, to the Penabscot it’s biketagenigan and pekarakenigan, Micmac say wahawknigan. In 1665 French missionary Sabastian Rasles wrote about the Le Couteau Croche( hook knife), the Hudson Bay company listed it as the mocotaugan in a trade ledger from 1748, causing the more popular widely used name to be mocotaugan. Among today’s society it’s known as the Crooked Knife, coined so because of the sometimes drastic angles of which the blade was set into the handle. While this is a very good name to call it, it’s misleading, throughout the world many knives are known as crooked knives, even Death’s scythe was referred to as crooked knife. In ojibway it’s Waabikoman, ” something that shaves wood and brings it to spirit”.. Since this tool was designed and used by the indigenous people of woodland areas, it is my belief that the only proper and true name is the one spoken in the native tounge. With such importance to the traditional craftsman, even the shavings have their name. For ojibway speakers it’s ditibanewi-biiwikojiganike which emphasizes the long curlies made by the knife. So why the name change? Simple, during the colonization of turtle island native languages were banned and suppressed as a way to control the indigenous population. Now days since the suppression of the language and people who worked with and built these tools, we see lots of misinformation being put out. 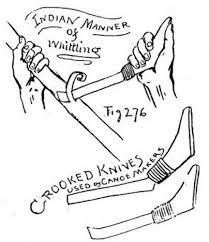 During the mid 1800s in the hight of the woodcraft craft craze we see authors writing about these “indian carving knives” or “indian crooked knives” usually accompanied with a poorly drawn rendition of a mokotagen. This poor information has now resurfaced since wilderness skills and bushcraft has become a popular fad once again. People looking to these woodcraft books to learn and not cross checking the information. This is not only damaging to this tools great history, it’s also continuing the misinformation of woodcraft students world wide. Thanks for the concern, my question to you is, how is posting about centuries old techniques and skills not unique in today’s hyperspeed mass manufactured world? Thanks for the interest. This site us new and still under construction. I was looking at your site and realized you could use the help of BlackThunderStudio promoting it’s products and services on your site, so if your willing to trade service for service then we have an accord. If I can’t spam your site with my work then I’d appreciate you not doing it to mine. Thanks and best of luck. Your site and your responses are awesome 🙂 thank you for taking the time to teach about the history of the knife! Im taking a birch bark canoe making class and have been working on making many of these knives, very grateful for the history lesson!